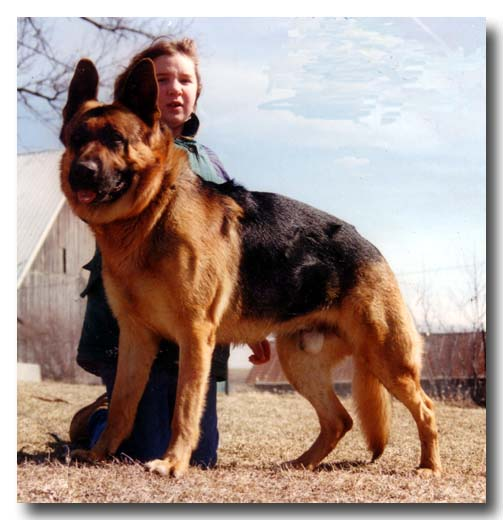 Breeding Oversized, Large German Shepherds. 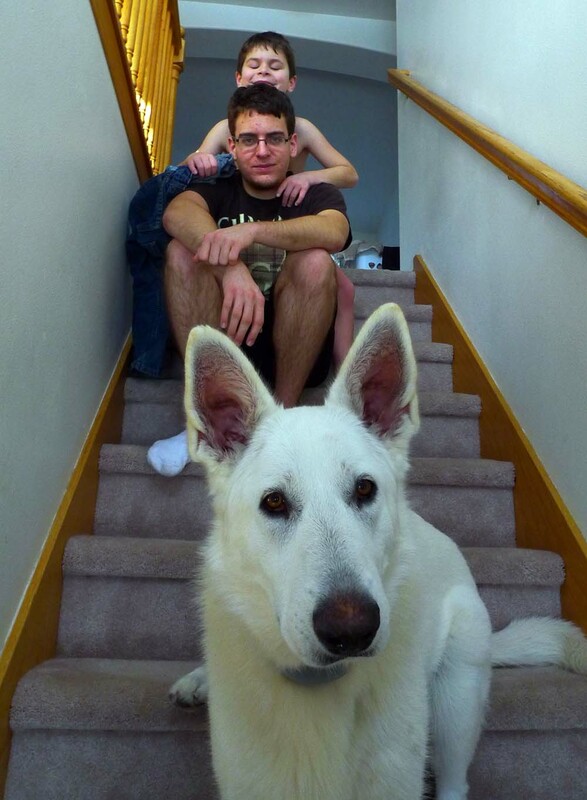 big dogs in the mid-west family. All puppies bred here are DM normal-non carriers. (I Will no longer ship puppies via airline (ALONE) you can always fly here pick up baby and fly back with pup under your seat that has worked very well for many of my people...also delivery is possible be prepared to come here (IOWA) before you put down a deposit) we are in the middle of the US so not to far from anywhere...Delivery is also an option part way or all the way we will go up to 10 hours from Iowa for the same price as airline shipping :) Typical deliver sights are Colorado, North Dakota , Minnesota, tennessee virgina ,arkansas,Ohio and Oklahoma.. Proud to be one of the few ,AKC Breeder of Merit !!! click on the cert to see that & kennel inspection & AKC report. Breeding for 30 years and always breeding to Improve. Honesty is my policy. I do not exaggerate size or make dog's overweight to look bigger, I clearly show all pedigree's & genetic tests good or not on that dogs page, I also give akc papers and pedigree's at the time you pick up your pup so you can be better assured of the breeding of you pup. I list all puppy people in order of deposit on line. So you can be assured of your choice is what you get ,even if shipping..I do not charge more for pick pups. Or take Offers from buyers to pay more for a higher choice. Large,Heavy boned,OFA certified/ pen hipped ,DM normal & Cardiac tested,Old- fashioned,straight-backed, Long lived (11 to 14 average for my dogs) Parent dogs that are "trained & often titled" not just kennel dogs. 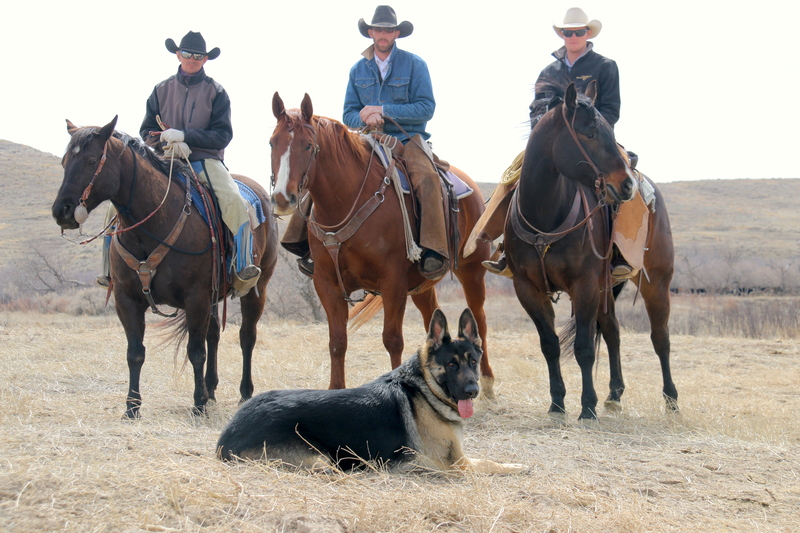 when you visit you will see well mannered ,well socialized, trained dogs. Outside of kennels, in the house, and off leash. One of the Very Few old- fashioned breeders in the US who post Health certifications and pedigree's online for all to see and check before purchase (completly open for all to see I do not hide lines from other breeders or pet people)! . I promise never to breed a female dog beyond 6 years of age. or any male beyond 8. 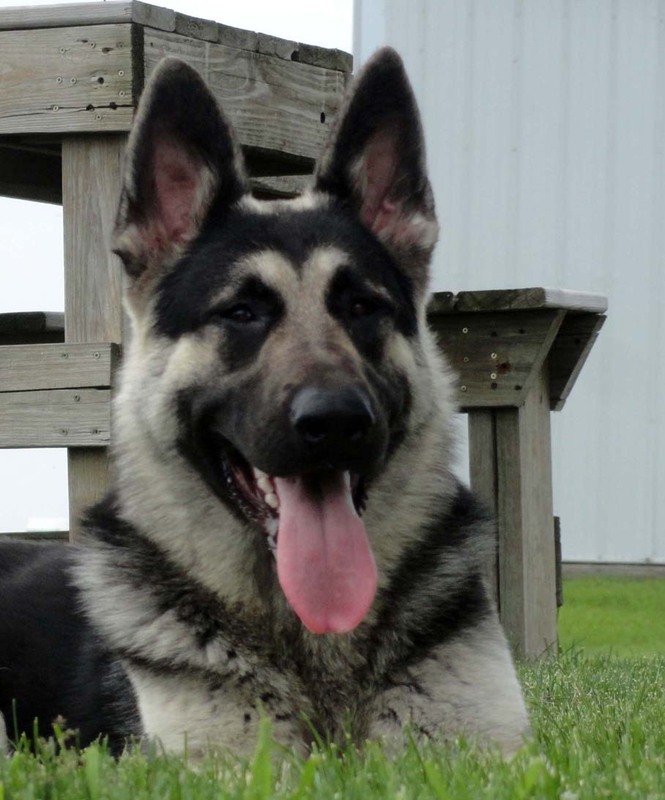 "Experience the Difference of the Large, Old-fashioned German Shepherd bred for the Family "
German Shepherd Breeder of "Quality" not "Quantity" for more then 30 years. Typical of old lines, our dogs are considered oversized for today's standards. They have straight backs and wide heads, as well as big bone and a calmer, family style temperament while still being protective. These dogs excel as: search and rescue dogs, high level obedience, guide dogs for the blind. However, size is secondary to longevity,brains, and athletic ability.I think it is fair to say I do more genetic tests then most breeders out there.. With that my main goal is Smart & healthy .ROYALAIR breeds dogs that we feel have superior brain power, you will be amazed at the ability of these shepherds... Bringing back what the shepherd used to be is my passion. 10 minutes from Interstate I-80 visitors welcome! I answer ALL my e-mail with in 24 hours so if you do not hear back call me! e-mail for me often do not come though.. ENTER SHORT CUT SITE (Just my dogs) & many pages of reference letters . Please excuse the spelling & or grammar on this sight .I am very dyslexic and find it almost impossible to edit my self , I update and write things all the time so my helpers cannot keep up with all I write if you see a page that is bad please e-mail me that page. This site after 20 years of writing & research has made my site very large and I have missed many pages. 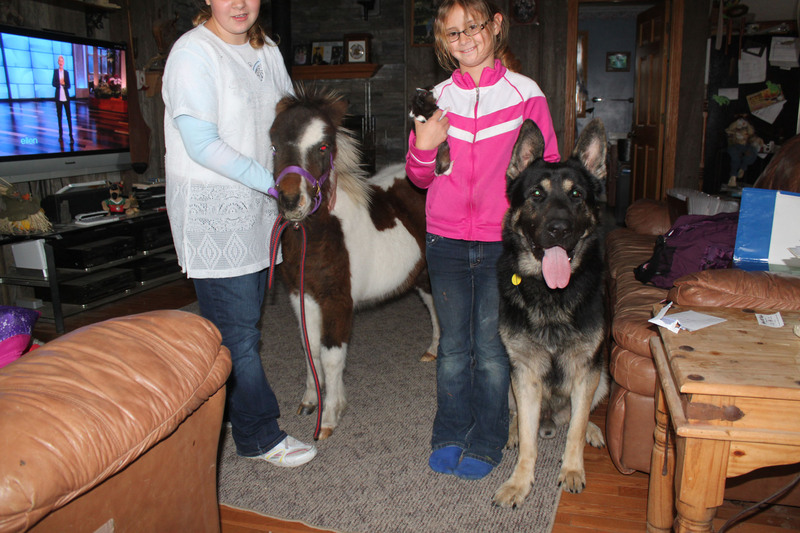 Michelle 11 yrs, Pony 1 yr., Guinea pig 6 months,Melissa 10 yrs, Duke 16 months -all of them in the house together? "PRICELESS"
Black and Reds and Tans all these males over 120 lbs & parents are 12 to 14 years old! MY two main grandmothers Kira lived to be 14, Sam (Kody's mom) Lived to be 13. Large Black and Silvers, I also get white on occasion. All these colors are known for smaller size but not in my lines! Two in this line-up are females and the black pup is only 7 wks old! Please excuse the spelling & or grammar on this site .I am very dyslexic and find it almost impossible to edit my self , I update and write things all the time so my helpers cannot keep up with all I write if you see a page that is bad please email me that page. This site after 20 years of writing & research has become very large and I may have missed corrctions on many pages. Solid Structure leads to healthy dogs ...Beauty is more then skin deep...and YES 100+lb dogs can fly! 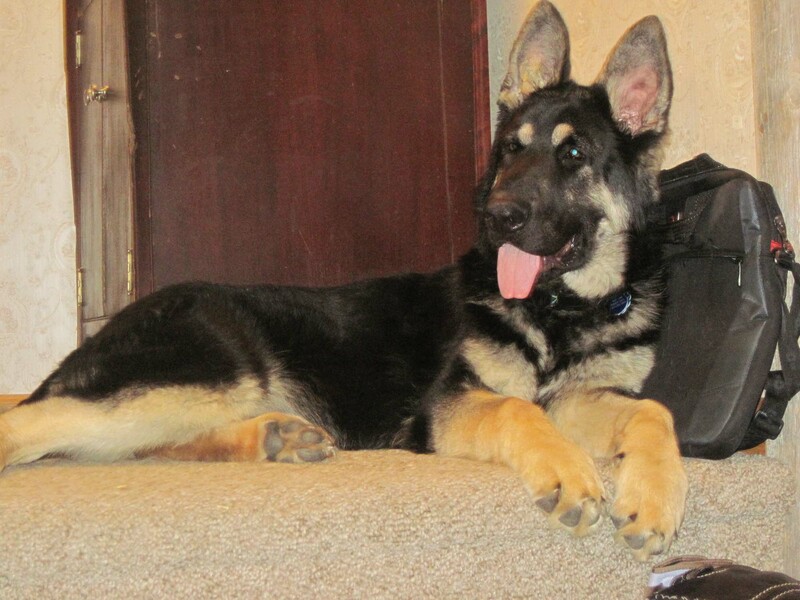 See MY German Shepherd Socializer's! GreatDogSite.com comprehensive, in-depth German Shepherd information. About AKC & Other dog registries: AKC & UKC are the ONLY All breed registries with a DNA program -Beware of puppy mill registries such as APR (american pet registry), & AKA as well as others. You are supporting puppy mills if you buy a dog with these registries as they are mainly for puppy mill breeders, You know what you get with AKC because of record inspections and DNA. All Buyers should beware! 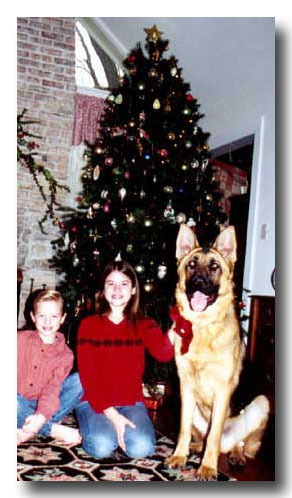 Here is a good example: two APR kennels close to me raise GSD's. 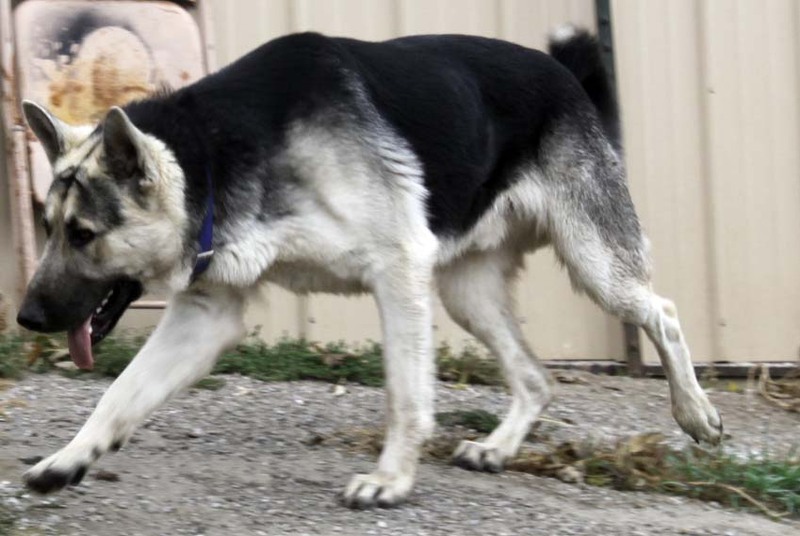 Both are breeding females that are not German Shepherds (they looked like husky crosses) but are registering them as German Shepherds and the registry does not care. I have personally seen it and so have many others. Support "good breeders" and, no matter what the breed, buy AKC/UKC. Do it yourself dog training Click Here! This one is an Online training sessions at your own speed ..Click Here! Video training for house training and to correct bad behaviors of every sort ...Click Here! Potty training in 7 days a manual .Click Here! good dog food homemade recipes .....Click Here! dangers of commercial dogs food..?..Click Here! Allergies ..I 've been told it works? Click Here! A pamphlet on Hip-dysplasia from people that have gone through it Click Here! 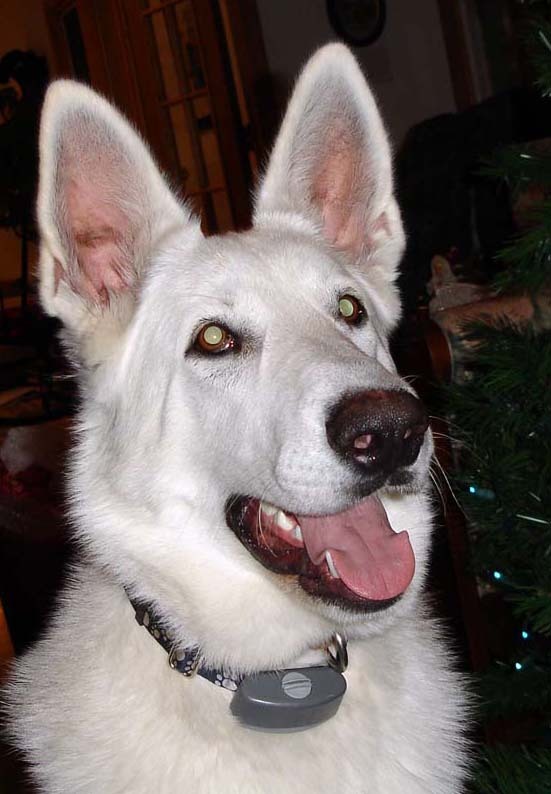 A book all about the german shepherd Click Here! another book for just shepherds .....Click Here! 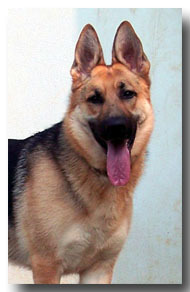 GERMAN SHEPHERD GIFTS- WITH PHOTOS OF ROYALAIR GERMAN SHEPHERDS! Are you looking for size? Here are some pointers! #1. 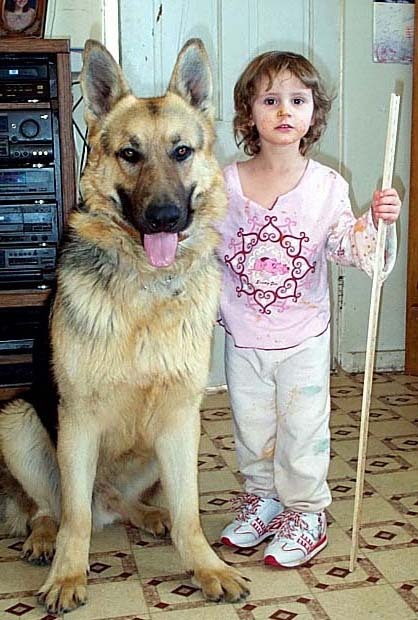 Most breeders of large german shepherds exaggerate by 50 lbs and several inches or more! #2 . Vet certified weight means nothing if you can't call the vet ! # 3. Size means little if temper , health and longevity are not there ! #4. If they won't let you see the dogs-STAY AWAY! PLEASE NOTE: It should be known that a breeder in CA- (Lanes Shepherds -now Superior shepherds, or A superior shepherd) has copied my breeding goals and much of my web site and my personally written information and views without permission.Basically just replacing Royalair with his kennel name.I am not affiliated with, nor am I a co-breeder with this gentlemen. To date he refuses to take my breeding goals off of his site. He has only been breeding 5 years as of 2007. 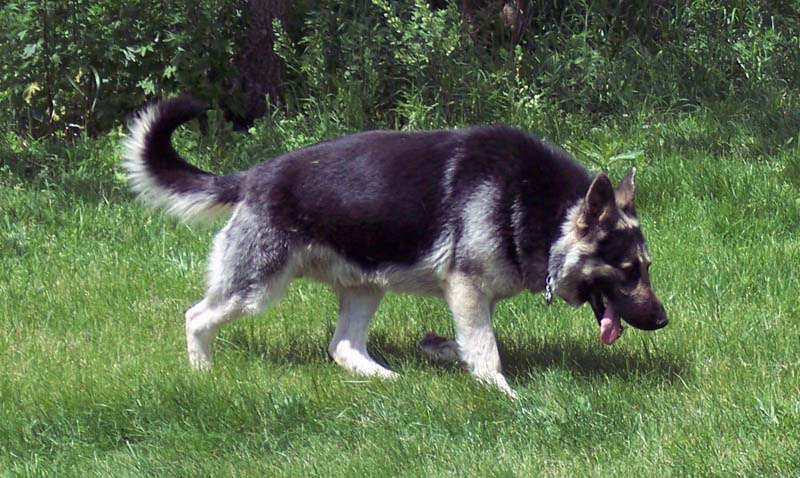 German Shepherd - check out GreatDogSite.com for German Shepherd information; read reviews, view photos and ask questions.